Turn left and follow the surfaced cycle path through Mill Marsh Park alongside the River Bovey. On reaching the A382 dismount and walk along the path as it ducks under the road. Turn right (picking up Dartmoor Way signs once more) and continue along the former Wray Valley railway line through the Parke estate for almost 2km/1.25 miles, almost immediately crossing the River Bovey again. Side-trip to Home Farm Cafe. At the end of the first cutting follow signs left across Parke Bridge; follow the track uphill to find the cafe behind the main house. 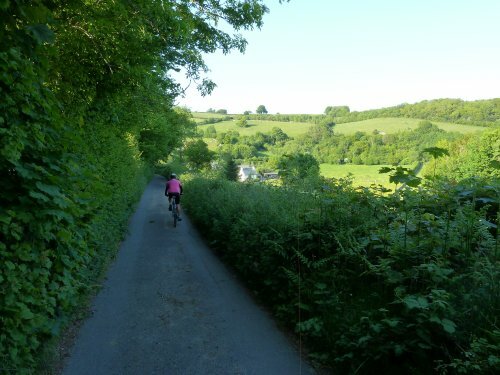 This section of the Wray Valley Trail, opened in 2013, follows the trackbed of the former GWR Newton Abbot-Moretonhampstead branchline, which was completed in 1866. In the 1890s trippers were taken from Bovey station up to the moor in horse-drawn vehicles, soon to be replaced by motorised charabancs. The Parke estate is owned by the National Trust, and home to both the Dartmoor National Park headquarters and the Dartmoor Pony Heritage Trust. At the end of the Parke estate the path descends (turn right here, the Wray Valley trail continues over a new bridge)to a gate and a three-way lane junction near Wilford Bridge. Side-trip to Lustleigh. Turn left, and almost immediately right. Follow the lane for c2.4km/1.5 miles until reaching the Lustleigh sign, then turn left on a narrow lane between thatched houses (Wreyland). At the T-junction turn right and follow the lane alongside the cricket pitch and under the old railway bridge to emerge in the centre of the village opposite St John’s Church and by The Cleave PH. Return the same way. often featured on `Beautiful Britain` calendars. Tourists have been drawn to the village for years, their numbers boosted by the arrival of the railway. By 1900 a Temperance Hotel had opened opposite the Cleave Hotel to accommodate visitors of differing tastes! Keep straight on, soon ascending to a T-junction. Turn left; after a long and steady ascent the lane bears sharp right at Hatherleigh Farm, then undulates before dropping steadily to meet the A382 at Slade Cross. , eventually levelling to reach Poolmill Cross after 1.6km/1 mile. For Hennock turn right. Return the same way. 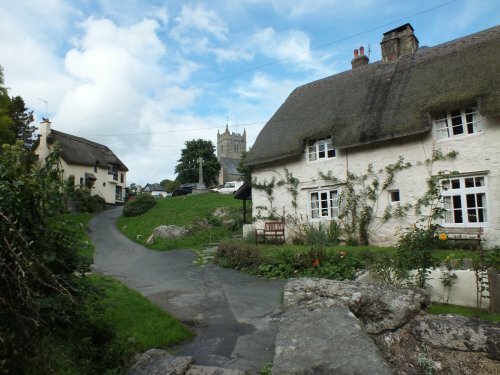 The little village of Hennock has an enviable position on the western rim of the Teign Valley, with superb views east towards the Haldon Hills and beyond. The settlement is thought to date from pre-Domesday times. Tin and iron ore was mined locally in the 19th century; Teign Village - two terraces of cottages - in the valley below was constructed from 1910 to house workers for The Teign Valley Granite Company. Turn left; after 300m turn right at Bullaton Cross (by the car park/picnic area for Trenchford Reservoir). The lane crosses the dam; follow the lane on to cross the next dam (for Tottiford Reservoir; picnic area right). At the T-junction (with Kennick Reservoir right) turn left. The narrow lane continues, ascending gently, and passes a radio mast; eventually it levels, with occasional glimpses of the open moor ahead left, and Blackingstone Rock looms into view on the right. Dartmoor`s granite tors never fail to impress, and none more so than Blackingstone Rock, an outlying tor which rises 25m/80 feet above the ground on its highest side. In Victorian times a vertical iron ladder was built against its east face to enable access to its sloping top, from which there are stunning views (no protection: take great care). 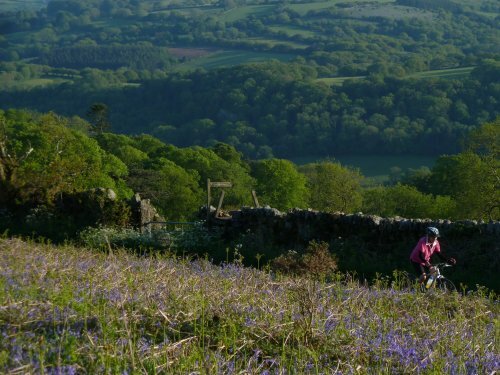 with wonderful views across the Wray Valley and the open moor ahead. Turn right; after 300m turn sharp left, soon descending alongside beech trees. past the pretty cottage at Pepperdon Hole. After c1km/0.75 mile reach the A382. Turn right for 100m (take care), then at the former railway bridge piers bear right off the road on the signed and surfaced Wray Valley Trail, passing behind cottages. At the end of the cycle path turn right up the lane to meet a T-junction on Pound Street. For Moretonhampstead turn right up Pound Street. Return the same way. 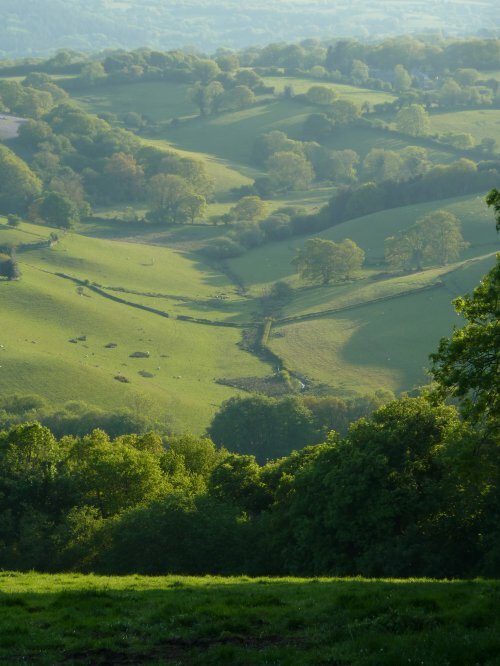 The ancient market town of Moretonhampstead is known as the `gateway to the High Moor`, and it a bustling little place on the main east-west trans-moor route. Its market charter was granted by King John in AD1207, at a rent of one sparrowhawk per year; the bird has become a symbol for the town. In recent years the town has seen the development of Greenhill, a gallery and heritage centre in the Victorian school by St Andrew`s Church, and the Dartmoor Transport Museum on Court Street.